At Barracuda Building Systems we supply and install steel ceiling battens, designed to give greater sound protection and allowing ceilings that have uneven joists or trusses to be 'levelled'. Our battens are cut to length, ensuring zero waste and savings on time and money. 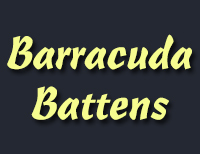 Barracude Battens do not bend, twist or warp and maintain a straight and true ceiling once installed. The battens come in two furring channel profiles, 35mm and 20mm deep. Both Steel Ceiling Battens are rollformed using 0.55mm BMT (Base Metal Thickness) Galvanised Steel. They are ideal for any ceiling shape and style, including diaphragm ceilings. We cater for a wide range of clients, including residential, commercial and industrial. Barracuda Building Systems supply and install steel ceiling battens. We make sure that the battens provide better sound protection. We provide services to residential, commercial as well as industrial clients.